lol, part man part pet, what's not to love? Do you remember out little meetup back in 09? ?ish at Geek.Kon Xizer? I forget who else was with you. 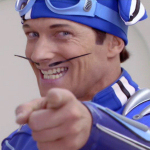 I'll still be up for a kickass lazytown cosplay group if I ever get the chance. My state alone has over 6 anime conventions...def have the venues to do it at. I gotta postcard today and well..